The plantation sector could get a boost through three new committees appointed by the Prime Minister yesterday, which is tasked with formulating master plans on industry development by the end of January and a fourth one to consider exemptions of Glyphosate imports for the tea industry. Plantation Industries Minister Navin Dissanayake, speaking at an event to launch year-long celebrations for the 150th anniversary of the tea industry in 2017, acknowledged that many areas of the sector needed development but expressed cautious optimism that stakeholders had “turned the corner” because of growing tea prices. He also appealed to stakeholders to “speak with one voice” to assist the Government in policymaking, calling on the main bodies within the industry to reach a compromise so that Sri Lanka could increase its competitiveness in the global market. “We have to do new things. We have to fight. We have to fight for new markets but also fight to keep our old markets. We need new products and we need to have better resources to fight issues like climate change. Our research institutions are poorly funded and there is a lot more work that needs to be done in these areas,” he said. The Minister also slammed “people with political agendas” who were fighting to maintain the controversial Glyphosate ban, which the tea industry has been lobbying against. Tea smallholders have pointed out that weeding by hand is difficult due to labour shortages and drives up production costs. They together with the Minister have been lobbying to loosen the weedicide ban to allow imports for the tea sector. “We are not asking for the ban to be lifted. What we are asking for is to bring in about 5,000 litres, which is nowhere near the 2.7 million litres imported in 2014. It is impossible to engage in commercial agriculture without weedicide. That is the reality. We as a country should have the space for democratic discourse and transparent policymaking. These should not be driven by selected people with vested interests,” he said. Prime Minister Ranil Wickremesinghe on Wednesday also appointed a committee to study the Glyphosate ban, which would be headed by Western Region Megapolis Project Chairman and Wickremesinghe’s confidante Ajitha de Costa. 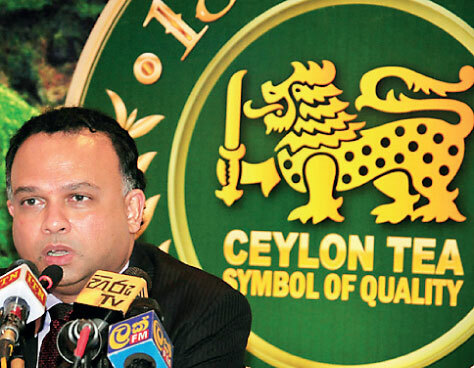 Despite its many problems, Minister Dissanayake was adamant that the tea industry would remain resilient, as it has proved over the past 150 years, and Ceylon Tea would remain a symbol of “purity and quality” in the world of tea. Responding to questions, Dissanayake also noted that the Budget policy of restricting Regional Plantation Companies to 5,000 acres would be allowed to happen organically rather than through strict State intervention. The Sri Lanka Tea Board, in collaboration with the Colombo Tea Traders’ Association, is organising a number of celebratory events to coincide with this Sesquicentennial Anniversary, throughout 2017. This will commence with the unveiling of a sculptured bust of James Taylor at the Head Office of the Sri Lanka Tea Board on 19 January 2017. A first day cover and a series of stamps will be issued in February 2017, followed by the release of a Rs. 10 coin by the month of August, to commemorate this anniversary. Between the months of March and July, a series of education fairs will be conducted in all seven tea producing regions, to serve as an outreach to the local community in an endeavour to infuse a better understanding of the relevance and importance of the tea industry to the country and its career opportunities and to create an awareness of the significance of this historic event. A unique ‘Global Ceylon Tea Party’, hosted by the country’s diplomatic missions worldwide, will be held on 18 May at 5.00 p.m. in each time zone around the world, serving fine Ceylon Teas and a specially created biscuit for the occasion by Maliban Biscuit Manufactories, the oldest biscuit manufacturer in Sri Lanka. The publication of a commemorative book, an authentic historical record of ‘The 150 Years of Ceylon Tea’, will be launched on 14 June 2017. During the month of July 2017, an International Tea Festival to promote the uniqueness of Ceylon Tea and the tea culture amongst tourists and Sri Lankans, through a festive atmosphere, will be held, with a focus on street events, featuring tea stalls, food stalls and entertainment, including performances depicting tea-related activities. It is intended that this will become an annual event in the future. An International Colombo Tea Convention will be held from 8-11 August 2017, with approximately 300 overseas delegates expected apart from significant local participation. Erudite presentations will be delivered by eminent personalities in the global tea trade and the international business arena, both from overseas and Sri Lanka, with expertise and experience in a wide spectrum of relevant disciplines, setting the tone for stimulating discussions and the sharing of diverse views, with competent moderators regulating the different sessions. Many other events have also been planned throughout the year.